Dream Dolls Gallery & More broke news about this fantastic specialty retailer exclusive Barbie, which can be seen at their website by clicking here. For those familiar with the series, you also know it’s been very popular with collectors with promises of new dolls coming out of the Grant-A-Wish Convention – see those dolls at papusilemele.com – click here. 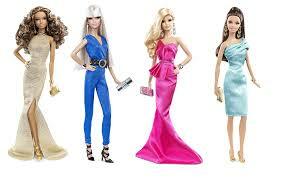 This new Grey and Black Dress Barbie is elegant, and follows the clean modern red carpet fashion shown in 2014 intro. Update 5/15/14 – Image now released and confirmed – this doll will not be on BarbieCollector.com!